British Prime Minister Winston Churchill, American President Harry Truman and Soviet Premier Joseph Stalin at the Potsdam Conference, codenamed 'Terminal', on 23 July 1945. The Potsdam Conference (17 July – 2 August 1945) was the last meeting of the ‘Big Three’ Allied leaders during the Second World War. 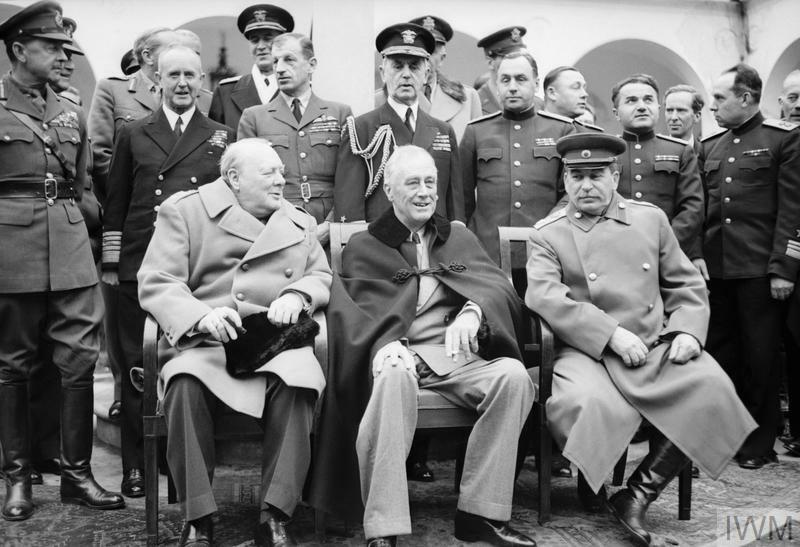 At Yalta in February 1945, British Prime Minister Winston Churchill, American President Franklin D Roosevelt and Soviet Premier Joseph Stalin had agreed to meet again following the defeat of Germany, principally to determine the borders of post-war Europe and deal with other outstanding problems. Britain's new Prime Minister, Clement Attlee, with President Truman and Marshal Stalin at the Potsdam Conference on 1 August 1945. Standing behind them from left to right are Admiral Leahy, Ernest Bevin, James Byrnes and Vyacheslav Molotov. 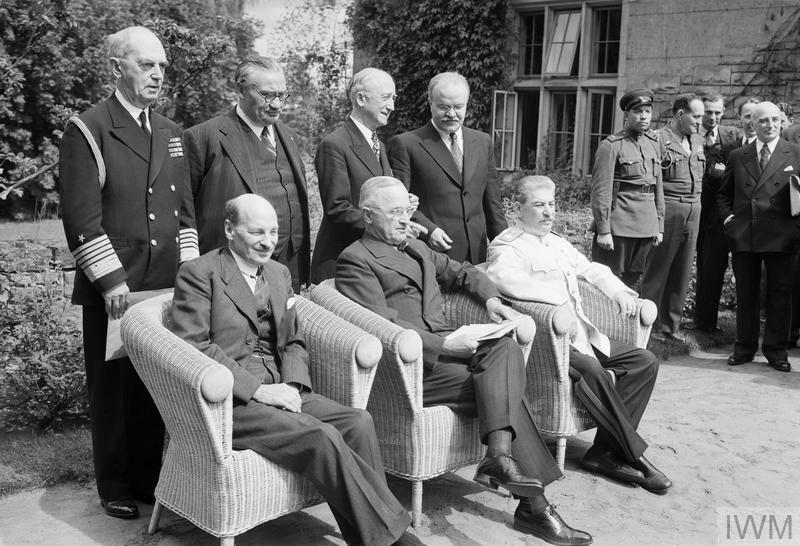 Both the atmosphere and leading personnel at Potsdam were markedly different from the previous ‘Big Three’ conferences at Teheran and Yalta. President Franklin D Roosevelt had died on 12 April 1945 and in his place was the new president, Harry S Truman, accompanied by his newly appointed Secretary of State James Byrnes. Halfway through the conference the results of the British general election, which had taken place on 5 July, were announced and Churchill and Anthony Eden were replaced by the new Labour Prime Minister Clement Attlee and his Foreign Secretary Ernest Bevin. Only the leading Soviet delegates, Joseph Stalin and Vyacheslav Molotov, remained the same as at the Yalta Conference. Britain and the United States were still at war with Japan, but the absence of a common enemy in Europe led to immense difficulties at Potsdam in reaching a consensus concerning the post-war political reconstruction of Europe. The optimism and amiability, however forced at times, together with ‘the atmosphere of compromise’ of Teheran and Yalta were also missing at Potsdam. 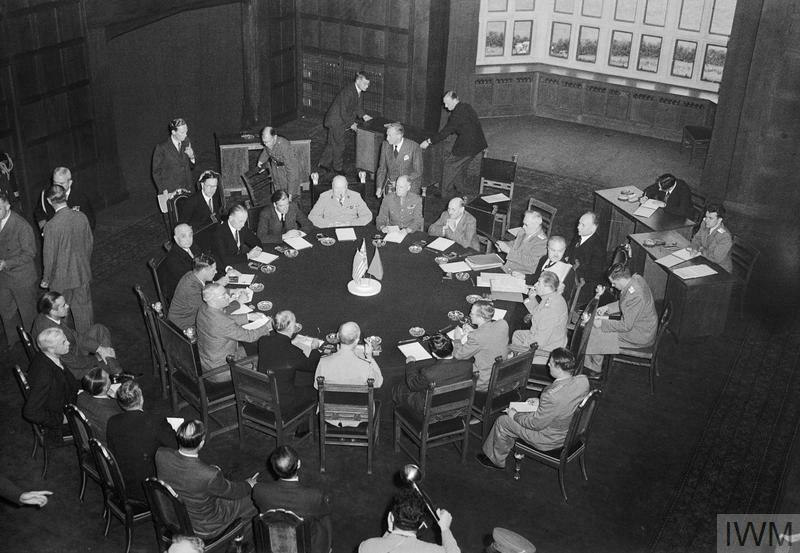 The 'Big Three' with their staffs around the conference table at the Potsdam Conference, 17 July 1945. 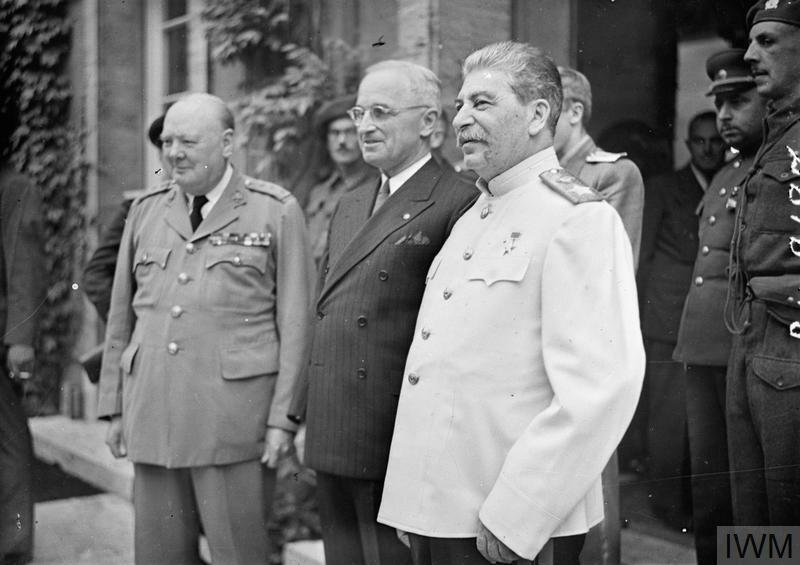 Despite many disagreements, the British delegation, Stalin and Truman did manage to conclude some agreements at Potsdam. It was decided that Germany would be occupied by the Americans, British, French and Soviets. It would also be demilitarised and disarmed. German industry capable of being used for military purposes was to be dismantled and the defeated country’s educational and judicial systems to be purged of Nazi influence. Nazi racial laws and other legislation were to be repealed and war criminals tried and punished. German society was to be reshaped on democratic lines but the reconstitution of the country as a sovereign state was postponed indefinitely. In the meantime Germany was to be run by an Allied Control Commission made up of the four occupying powers. Stalin was most determined to obtain enormous economic reparations from Germany as compensation for the destruction wrought in the Soviet Union as a result of Hitler’s invasion. He had raised the question of these reparations with Churchill and Roosevelt at Yalta. Roosevelt, with the aim of getting Stalin both to participate in the war against Japan and in the United Nations Organisation, had agreed to the Soviet dictator’s demands. But at Potsdam, Truman and Byrnes were anxious to lessen the Soviet demands, insisting that reparations should be exacted by the occupying powers only from their own occupation zone. This was because the Americans wanted to avoid a repetition of what happened after the 1919 Treaty of Versailles. Then, it was claimed, the harsh reparations imposed by the Treaty on a vanquished Germany had caused economic crises which in turn had led to the rise of Hitler. There was also agreement regarding the desirability of ending the ‘present anomalous position’ of Germany’s wartime allies - Italy, Bulgaria, Hungary and Romania - and its co-belligerent Finland. A Council of Foreign Ministers would be set up to determine peace treaties with them that would be concluded following a conference involving the Big Three and ‘other interested Allied governments’. This duly took place the following year in Paris and the treaties signed on 10 February 1947. There was also a good deal of wrangling over the Allied division of the German Navy's remaining ships and trusteeships of Italy’s former colonies in Africa. In both cases Stalin put forward demands which Churchill especially thought unreasonable. But the biggest stumbling blocks at Potsdam were the post-war fate of Poland, the revision of its frontiers and those of Germany, and the expulsion of many millions of ethnic Germans from Eastern Europe. The question of Poland had loomed large at both the Teheran and Yalta conferences. In exchange for its territory lost to the Soviet Union, Poland was to be compensated in the west by large areas of Germany up to the Oder-Neisse Line - the border along the Rivers Oder and Neisse. The Poles, and also the Czechs and Hungarians, had begun to expel their German minorities and both the Americans and British were extremely worried that a mass influx of Germans into their respective zones would destabilise them. 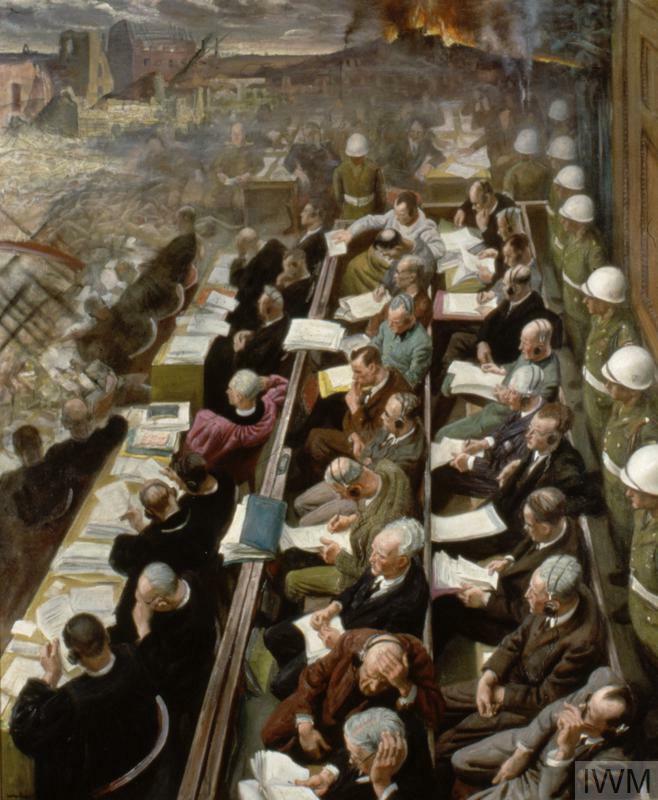 A request was made to Poland, Czechoslovakia and Hungary that the expulsions be temporarily suspended and when resumed should be ‘effected in an orderly and humane manner’. On the vexed question of what constituted a ‘democratic Poland’, the Russians and the Western Allies were never going to agree. But, as with a number of other issues raised at Potsdam, it was turned over to the Council of Foreign Ministers to try and resolve. A week into the conference, Truman told Stalin that the United States now possessed ‘a new weapon of special destructive force’ – he did not specify that it was the atomic bomb. Stalin, the President recalled, showed ‘no unusual interest’. This was undoubtedly because the Soviet dictator already knew of its existence through his spies in the West, but he told Truman that ‘he was glad to hear it and hoped that we would make "good use of it against the Japanese"'. Before it was dropped on Hiroshima and Nagasaki, Britain, the United States and China issued the Potsdam Declaration. This threatened the Japanese with ‘prompt and utter destruction’ if they did not immediately unconditionally surrender, but at the same time promised ‘it was not intended to enslave Japan’. The Soviet Union was not involved in this declaration as it was still neutral in the war against Japan. Potsdam was Harry Truman’s first major appearance on the world stage. Succeeding America’s greatest ever president a daunting prospect, but Truman impressed almost everyone at Potsdam with a brisk, business-like attitude and mastery of his brief. Churchill himself was not at his best at Potsdam. He was depressed, out of sorts and inwardly worried about the result of election back home. He missed the adrenalin rush that guiding the nation’s war effort had given him. He told his doctor ‘I don’t want to do anything. I have no energy. I wonder if it will come back’. He refused to look at briefing documents prepared for him by Foreign Office experts and instead indulged in lengthy and irrelevant discourse across the conference table. Just as he had done at Teheran and Yalta, it was Stalin who impressed Western observers the most. One of Churchill’s ministers wrote of how the Soviet dictator ‘spoke quietly and shortly, in little staccato sentences…in the discussions Stalin was often humorous, never offensive; direct and uncompromising…’. And one of Truman’s advisers noted how ‘Stalin’s mind had a strong retentive power. In taking up the opposing argument and states the points made. Then…he takes them one by one and answers them with counter-facts’. The three leaders all had a great sense and knowledge of history, but at Potsdam, which was just outside of Berlin, it was Stalin who had the last word on the subject. When asked if he felt great satisfaction at being in Berlin, Stalin replied ‘Tsar Alexander got to Paris’.